One of my favourite things about Christmas is the food. I'm a self-confessed chocoholic, so any time of year that gives you an excuse to sit down with a tub of Celebrations and follow it up with a cheese platter is alright with me. 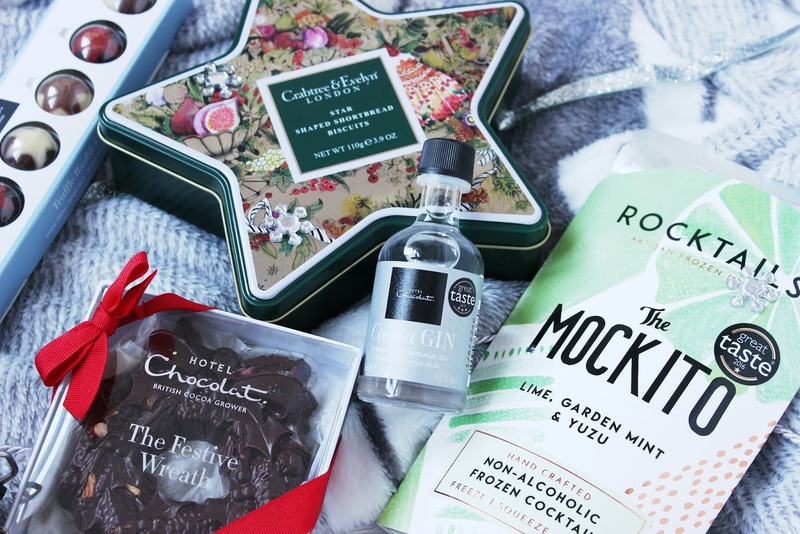 I thought I'd pull together a few gift ideas for all the foodies out there - whether you're into your cocktails, love chocolate or just need to find a good gift for your friend who has EVERYTHING. Hotel Chocolat is always my first stop when it comes to Christmas chocolates as they have such a great selection to choose from and it feels a bit 'nicer' than your standard box of Thorntons or Heroes. They do a really good job at catering for all budgets, so whether you just want a little stocking filler or a giant £50 truffle platter, they've got you covered. A few of my favourites this year are their Christmas Gingerbread Men, which are gently spiced milk chocolate (they taste very Christmasy! ); the miniature wreaths, which come in milk, white and dark, and also the Festive Baubles which have a mix of truffles. These are all around the £10 mark and would make great gift options for all ages I think. If you're after something less full on Christmas, then check our their Rare and Vintage section in the selector packets (which are about £3.95 each). These are all solid bars of single origin chocolate, but come in various different cocoa strengths and from lots of different producers worldwide. A few of these stacked up and tied together with a big bow would be lovely for someone who really loves their chocolate and wants to know more about the different types. For all you cocktail lovers out there, I'd highly recommend Rocktails, which are a non-alcoholic mixer that you bung in the freezer and turn into a delicious sounding slush puppy. Choose from flavours like The Mockito and Sunset Sling or pick up a special gift box with all four in from QVC (£15ish) who have these as part of the Great Taste Awards. 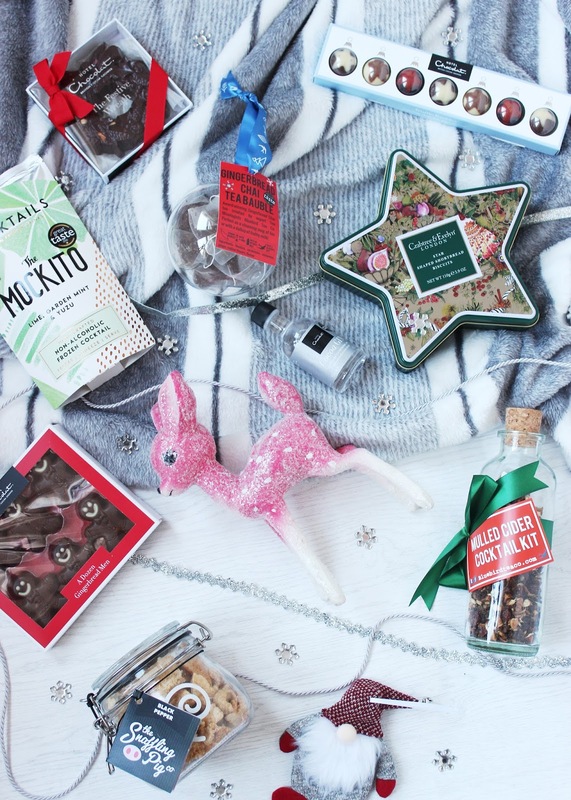 They taste great with or without alcohol, so make a good party piece if you're trying to please both audiences, but I do love them with a healthy shot of gin or vodka thrown in - it is Christmas after all! 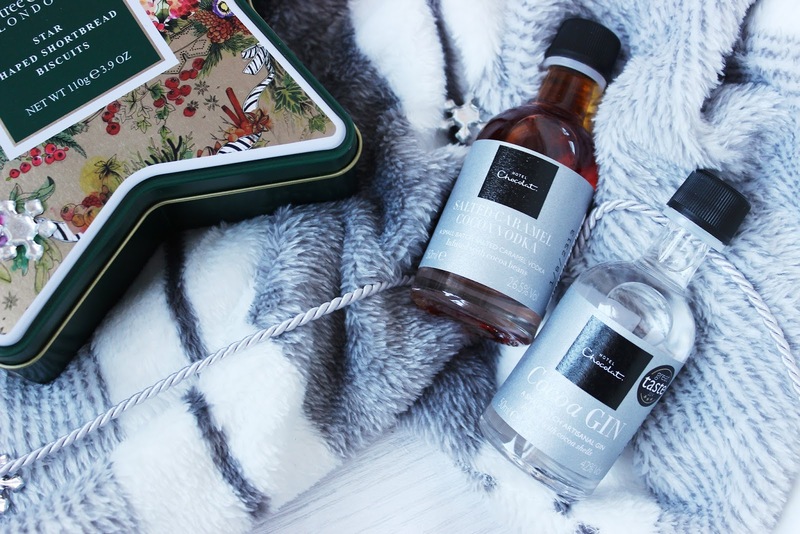 I had no idea about this, but Hotel Chocolat also have their own Gin and Vodka range. The Vodka is Salted Caramel flavour and unbelievably delicous and the Gin is made with the shells of cocoa beans, so has an interesting flavour to it, but doesn't taste like chocolate (like I had initially hoped, ha ha). If you want to add something extra to your drinks gifts, then Oliver Bonas have some great cocktail glasses and swizzle sticks, including the infamous copper pineapple goblets. A bundle of one of these, a bottle of their favourite spirit and a package of Rocktails will definitely go down a treat. I've become a bit obsessed with the Bluebird Tea Co since I tried their Spiced Pumpkin Pie tea a little while ago. They have some lovely gift ideas for both tea and non-tea lovers. 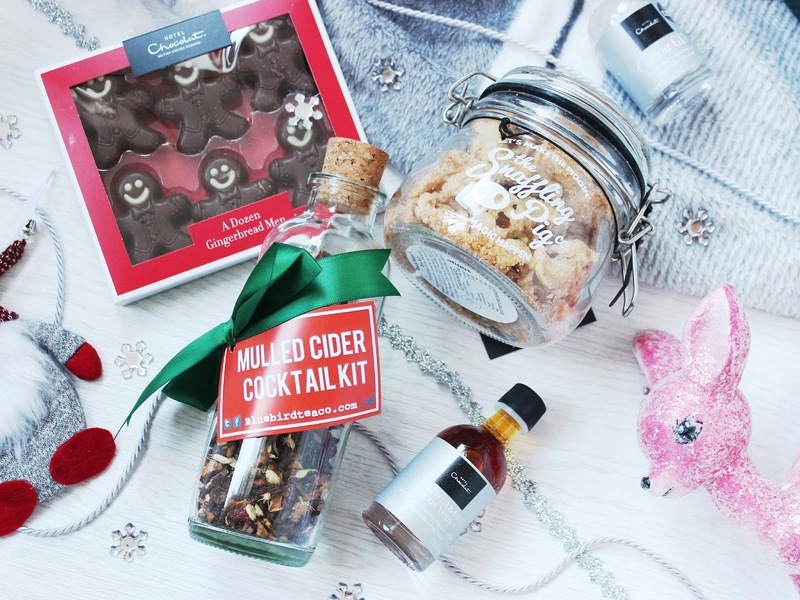 My favourite has to be the Mulled Cider Cocktail Kit (£7.50) as I LOVE mulled cider at this time of year. You can either gift the bottle as it is, or make up the cider, cool and repackage in the bottle to give as a complete gift. It would also do really well with warm apple juice if you prefer a non-alcoholic alternative. Their Gingerbread Chai tea bauble (£7) would make a great stocking filler - it comes with ten tea bags inside, which are a limited edition blend created especially for Christmas. Now, all of these drinks need to be washed down with something, so why not accompany them with a pot of gourmet pork scratchings from the Snaffling Pig Company? These are another entrant into the Great Taste Awards with QVC and I can fully confirm, taste absolutely delicious. For something sweeter, Crabtree & Evelyn's Shortbread Biscuit Star Tin comes top of the list. It's packed full of mini shortbread stars (yum) which are buttery, delicious and I could probably eat a whole tin to myself. A package of these and the Gingerbread Chai Tea Bauble would be a really lovely combo. I'll have lots more gift ideas coming up next week, so keep your eyes peeled for lots of beauty gifting, stocking fillers and of course, the men's!